Rachael Rabbit: Happy New Year - Meet the Halnaker Rabbits! Did you all have a good Christmas? And New Year? I got a nasty cold for Christmas and since returning from the UK I have been a big sniffle monster. I know it must be bad as my husband has kept a good distance "I don't want to get ill" is his excuse ... but I fear it is because snotty sniffle monsters are just not that attractive! Over the holidays I visiting lots of people (hello everyone!) I spent a lovely 6 days with my mother in her country cottage in Halnaker. My mother (bless her) does have some Scottish tendencies and about 35 years ago she had knitted some cable knit sweaters. 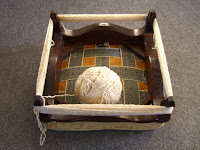 She had nobly kept these sweaters and recently unravelled them .... and had the yarn ready to "make something". 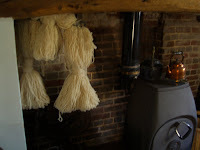 Well along came greedy yarn daughter Rachael ..... and we spent a few days winding, washing, drying and finally winding the yarn into balls. 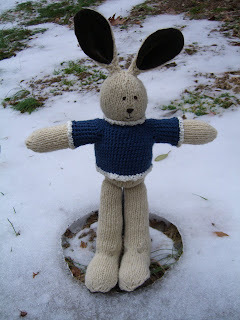 For 2008 I have changed my knitted rabbit pattern. 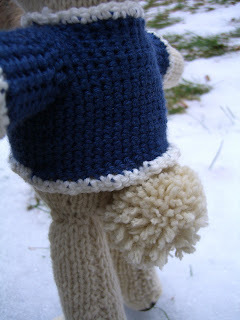 I have named the new pattern the "Halnaker Rabbit"! I have changed the ears on these rabbits (they stand straight up) and their legs are much longer too. After having some healthy input about my softies and their faces from my sister ... hum... I have also changed the way I embroider the face too. Instead of sewing the clothes I made some little crochet outfits. and the boy rabbit has a little blue jumper on. What do you think? I wish I was a better photographer ...... they are really quite sweet and I'm not sure my pictures do them justice. The Halnaker Rabbits will be available at my Etsy store very soon .... and I will be knitting many more this year. For New Years Eve our friends, the lovely Smiths, came for a wild and crazy game of Clue and a stock based fondue.... and let me just repeat how wild and crazy we all were (in bed by 12.15!). On New Years Day (between sniffles) we wrote our new years resolutions. I have kept these and intend to bring them out again next year ........ one of mine was "make more rabbits" .... now why doesn't that surprise anyone?? Labels: knitted rabbits, new year, recycle. These halnaker bunnies remind me of an awesome jumper had when i was 6-9. 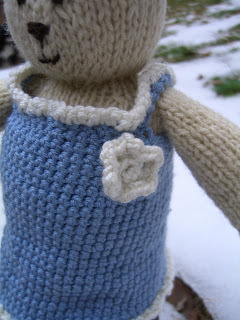 It was a knitted white jumper and had a grey bunny in a blue dress (much like your bunny) and the bunny was holding a daisy chain of flowers and then on the back was the back of the bunny with a fluffy cottontail! 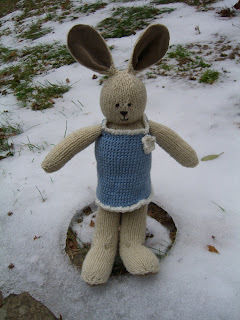 i think i thought of it as my beatrix potter rabbit jumper! ah, the memories!